This is my first venture into furniture making. It was a three person effort, with my dad, the boyfriend and me, and none of us had worked with leather before! The initial challenge was getting all the materials. 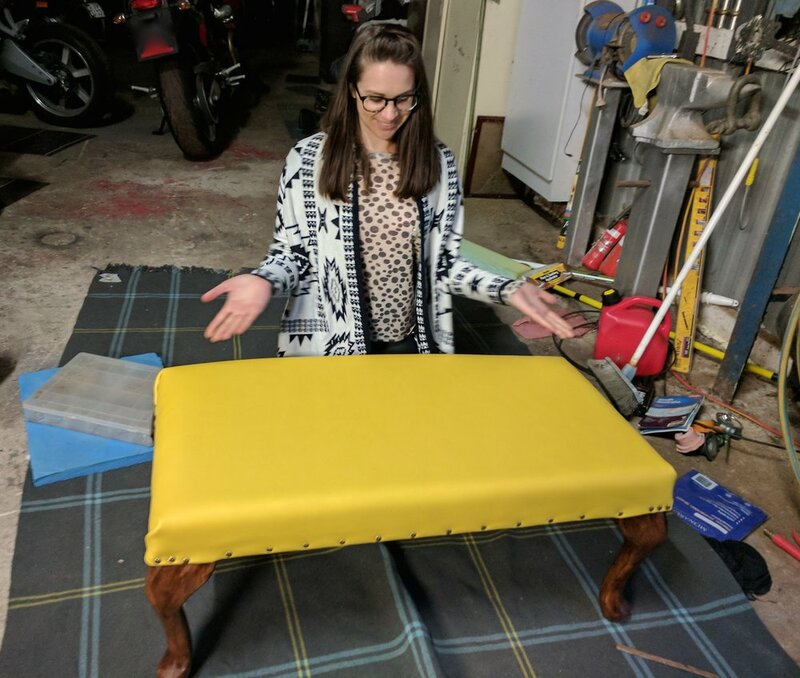 I'd originally wanted to find a second hand table which I could cover in the foam and leather, but that proved difficult as I wasn't able to find a table the right size. Instead I found an upholstery place online called Home Upholsterer which sold foam cut to size, and decorative table legs, among other things. They were also very helpful when I called with questions, and followed up with more emailed questions. Apologies if my instructions aren't clear, as I'm going to give a high level description of what we did in case you're wondering. Full disclosure - there are some things I would do differently next time but as a first time attempt I'm super happy with it. First you need to make the table. We attached the legs to the plywood with screws and wood glue. The legs already had pre-made holes in them which made this very simple. Note: In hindsight before you make the table, I'd recommend gluing the foam to the plywood, and stretching and attaching the leather at this stage. This will result in smoother edging on the corners, and you can hide any of the corner bunching when you attach the legs. As we didn't do this, I'll continue on. We then used wood glue to glue the foam to the top of the plywood before attaching the leather. Lay the leather over the foam bench, and measure. Cut away any excess making sure you have enough to stretch over the table and staple the leather underneath. Once stapled you can hammer in your decorative nails. Make your way around the table, leaving the corners until last. We left them last because we weren't sure how to handle them! And you'll see the corners are a little lopsided. Now that I've completed one upholstery project (with much appreciated help from dad), I think I've been convinced to do more.